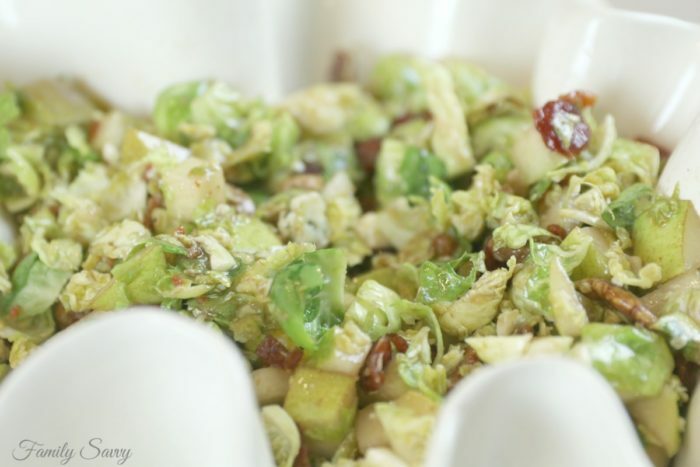 Everyone will rave over this shaved Brussels sprouts salad with pecans, pears & Gorgonzola~a copycat recipe of my favorite salad at Pizzeria GM. Of course, I came home and decided to figure out how to make a copycat version. So I took the list of ingredients from the menu and just put them all together with my recipe for maple balsamic vinaigrette. Results? Outstanding! My family LOVED this salad! Brussels sprouts are popular right now, so this is kind of a “trendy salad” to make for company. Because the sprouts are shaved, some folks might not know what they are eating (and some may think it is cabbage). I hit some high points for questions you might encounter about this salad and how to make it and what ingredients to buy. This should help you make the best version of this you can make. What are shaved Brussels sprouts? Basically shaved Brussels sprouts are just chopped or thinly sliced into small slivers or pieces. I toss my whole Brussels into my food processor with the chopping blade and pulse until they look right. You can also use the blender (in a pinch) or buy them already shaved (but they are expensive). Which pear is best for salad? I love Bosc, which are crisp with a delicate, sweet flavor. Comice and Asian pears are other crunchy, firm pears that work well. Bartletts are good for eating (when you want a juicy pear) but too soft and wet for salad. Which nuts are best for this salad? : I like to use lightly glazed nuts for this salad; the sweetness balances the blue cheese and balsamic. Trader Joe’s has some lightly glazed pecans that are great. 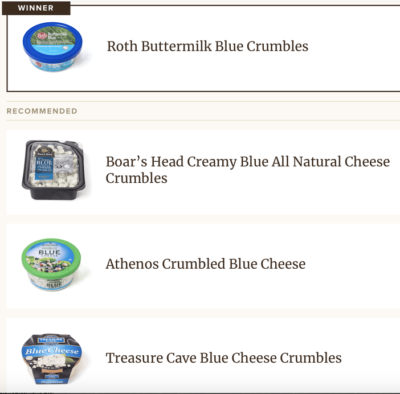 Which gorgonzola is best for salad? I have a membership to the online Cook’s Illustrated, so I referred to their recommendations for the best gorgonzola (blue) for this salad. A snippet of their taste test results are below. Make ahead: The dressing can be made ahead (up to 3-4 days) and refrigerated. The Brussels sprouts can be shaved and refrigerated in a container for a day or two. Then the other ingredients can be added when you want to make and serve this; it should come together in less than 10 minutes. This salad really is divine; I hope you give it a try! If you do, please leave your thoughts in the comments below. As always, thanks so much for stopping by. Be blessed, and stay savvy!!! Place Brussels sprouts in food processor; chop until shredded and slivered. 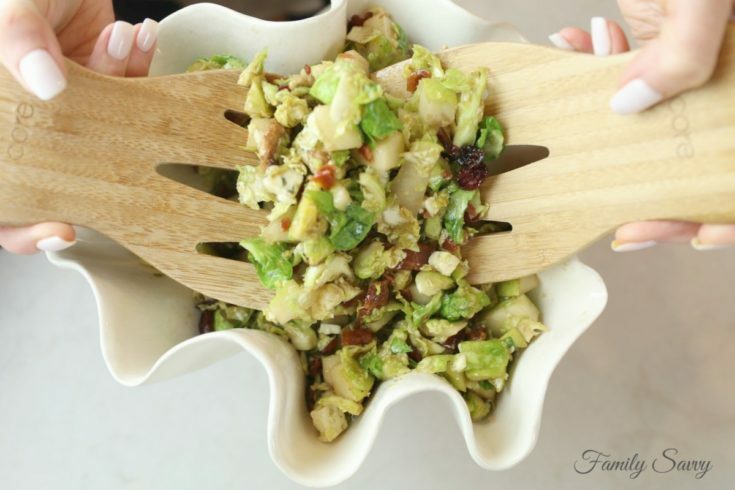 In large bowl add Brussels sprouts, pear, pecans, cranberries, bacon and gorgonzola. Whisk together vinegar, syrup and mustard until well blended. Slowly add EVOO, whisking until emulsified. Add salt & pepper and whisk again.